Did you know that an eye exam can detect signs of serious health conditions? According to a 2011 study, eye doctors found symptoms of some diseases before other health care professionals. This included diabetes, high blood pressure, and high cholesterol. Also, people are more likely to have a regular eye exam than an annual physical. So an eye exam might be the first opportunity to alert people about a health issue. Why Can Eye Exams Detect a Disease? By using drops to make your pupils bigger, an eye doctor can look inside your eyes at blood vessels and the optic nerve. This allows the doctor to see symptoms of various health conditions without any pain or discomfort for the patient. Of course, the main reason you go to an eye doctor is to check your vision. About 11 million Americans who are 12 years and older require vision correction. And, many of them don’t realize their vision is affected. Even though older people typically have more vision problems, children should also get an eye exam starting around three years of age. The number one reason for children losing vision is amblyopia, also known as lazy eye – it affects 2-3 of every 100 children. With amblyopia, the eyes and brain don’t work together correctly. Those with diabetes should have an eye exam once a year. Diabetic retinopathy can cause blindness, but finding it early can stop or slow down vision loss in 90% of those with diabetes. Those who are at risk for glaucoma need to have their eyes checked at least once every two years. If others in your family have had an eye disease, you may be at higher risk for that condition. So it’s a good idea to know your family’s health issues. Where Can I Get an Eye Exam? If you’re in the Houston area, Eye Care Associates offers comprehensive exams for your vision and eye health. They examine your eyes and eyelids, check your eye pressure, and discuss treatment options. 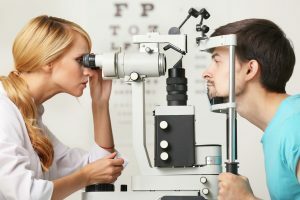 Eye Care Associates also offers treatment for dry eyes, computer vision syndrome, sports vision therapy, and other care. You can call our office at (713) 621-9001 and they are located at 5320 Richmond Avenue in Houston.